The Desert Views subdivision, built by Shea Homes, are located Northeast of Troon Mountain. These production single family detached homes are 1-story and range from 1,500 to 2,100 square feet. This subdivision is in the northeast corner of the prestigious Troon Village community. At some of the highest elevations in the community, these subdivisions share boulder outcroppings and stunning views of Troon Mountain, McDowell Mountains, Four Peaks, and the Continental mountain range. With the higher elevation you will find cooler temperatures and cleaner air. 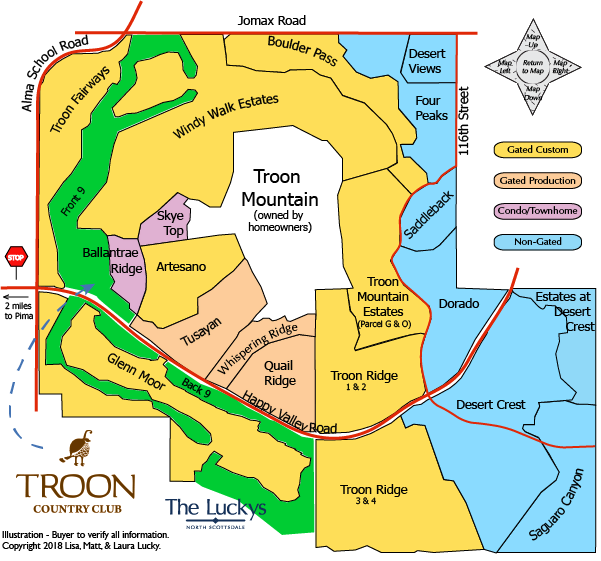 The Four Peaks at Troon Village subdivision, built by Shea Homes, are located Northeast of Troon Mountain. Homes range from 1,810 to 2,800 sf. This subdivision is in the northeast corner of the prestigious Troon Village community. At some of the highest elevations in the community, these subdivisions share boulder outcroppings and stunning views of Troon Mountain, McDowell Mountains, Four Peaks, and the Continental mountain range. With the higher elevation you will find cooler temperatures and cleaner air. Coming and going you will enjoy distant views of untouched high Sonoran Desert, and mountain views in all directions. Saddlback in the Troon Village community offers 2 and 3 bedroom homes with views of McDowell Mountains, Troon Mountain and Four Peaks. Saddleback homes range from 2,090 to 2,400 square foot range, most are single level. A community by Saddleback Builders. Dorado is a subdivision by Centex Homes located southeast of Troon Mountain. Dorado are production single family detached homes, 1-story, and range from 2,400 to 3,200 square feet. Most homes have a pool and/or spa and 3-4 bedroom floor plans. Desert Crest is a UDC Homes community located Southeast of Troon Mountain. These production homes are 1-story and range from 2,600 to 3,300 square foot. There are 3 sections of Desert Crest - Each offer the same floor plans with range from 3 to 4 bedrooms. Most homes have pools and wonderful views of the McDowell Mountains and Troon Mountain. Saguaro Canyon is a community of the larger production homes by Shea Homes. Homes range from 3,000 to 4,100 square feet. Floor plans offered 3 to 5 bedroom plans. Most homes have a pool and/or spa with entertain features like outdoor fire pits and views of the McDowell mountains and Natural Area Open Space (NAOS). Estates at Desert Crest is a peaceful quiet neighborhood of large custom home lots. Spectacular views of McDowell Mountains and sunsets. Lots range from 1.5 to just under 4 acres. Gated community of custom luxury homes on large lots with mountain views. Troon Ridge 2 gate is on the North side of Happy Valley and backs to South side of Troon Mountain. Within Troon Ridge 2 is the Los Pueblos project. Homes range from 2,700 to 6,800 square feet. Troon Ridge 3/4 gate is on the South side of Happy Valley road and backs to mountain preserve. Some custom homes back to the back 9 of Troon Country Club. Large trees border the wash that runs through the subdivision. Incredible views of Troon Mountain, Pinnacle Peak, and the West Valley city lights. The Quail Ridge and Whispering Ridge subdivisions shace a common entrance. This gated community on the south side of Troon Mountain, on single-loaded streets. Most homes backyards face the city light views. Homes were built by Geoffrey Edmunds (Toll Brothers). Quail Ridge was developed after Whispering Ridge. Quail Ridge homes offer natural gas and larger version of floor plans than found in Whispering Ridge. The Whispering Ridge and Quail Ridge subdivisions shace a common entrance. The gated Whispering Ridge community is on the south side of Troon Mountain, with most home's backyards facing the city light views. Homes were built by Geoffrey Edmunds (Toll Brothers). At the very top of the community is the original 7 Troon Ridge non-HOA custom lots. The Whispering Ridge community pool has outstanding views of Troon Mountain, McDowell Mountains, Pinnacle Peak, and city lights. The HOA heats the pool several months of the year. Tusayan by Monterey Homes is within walking distance of Troon Country Club. This gated community of hillside homes offer city light & mountain views. Floor plans from 2625 to 3380 SqFt. Most homes have a coupe interior steps, a 2 car-garage and no pool. Great setup for a lock and leave lifestyle. The community pool/spa offers views of the valley below. Tusayan Estates, at the top of the community are custom homes on half to nearly 8 acres. Incredible views of the valley and city lights. A spec home is underway and another is planned. Artesano has custom Luxury homes in a guard gated community on Southwest slope of Troon Mountain. Walking distance to Troon Country Club. Many Artesano homes back to Troon Mountain. Mountain & city light views. Artesano offers some of the most beautiful custom homes in the area. There are 50 half to 3+ acre lots. Glenn Moor is an exclusive gated community of approx 140 custom homes. The back nine holes of Troon Country Club winds through the community. Like Windy Walk, Glenn Moor has a 24 hour attendant on duty. Very unique - You actually pick up your mail at the guard gate. Club house has pool, tennis court, and plenty of parking. Homes are on half to multi acre lots. All homes have the same address : 10801 E Happy Valley Road. Troon Fairways is a gated community of luxury custom homes on lots ranging from half to 1 acre. Many homes are on the front nine of the Troon golf course. Other homes back to Alma School Road. Home prices vary based on location. Windy Walk Estates is a guard gated community of custom luxury estates on lots ranging from two-thirds to over 8 acres. The front nine holes of Troon Golf course wind through the West side of Troon Mountain. Most homes have wonderful views of mountains and/or city light. Some homes are within walking distance of Troon Country Club. Boulder Pass has custom and semi-custom luxury homes and lots, located on the North slope of Troon Mountain. Great sunsets over Pinnacle Peak. Troon Mountain Estates has large custom homes within the guard gated community on Southeast slope of Troon Mountain. Some homes have great views East to Four Peaks in the Mazatzal Mountain Range. Lots also available. Some beautiful custom homes in this area. Skye Top is a subdivision of 94 Townhomes within gated Troon community. Many with mountain & city light views. Built from 1987 to 2001. Most are 2 or 3 story. Easy walking distance to Troon Country Club. Great option for that lock and leave lifestyle. Ballantrae Ridge townhomes are within the guard gated community, bordering Troon Country Club. Homes along Troon's driving range have spectatular views of city lights. Most are 2 story units, some with stunning views of golf, city, and Pinnacle Peak. Ballantrae Ridge range from 2,000 to 3,200 square feet. Built 1986 to 1995. This Pinnacle Peak Area Real Estate Map covers the Pinnacle Peak area East of Pima Road, North of DC Ranch and South of the Reata/Troon Area. To the East is the McDowell Mountains and the McDowell Sonoran Preserve. Shopping, dining, the General Store, and Russ Lyon Sotheby's International Realty can be found at Pinnacle Peak and Pima Roads. Members enjoy more than just fine golf in a beautiful lush Sonoran Desert setting. There's jogging and walking trails, and tennis facilities throughout the community. Enjoy the 18 hole putting course, 7,000 square foot fitness center, and award winning clubhouse. There is an outstanding tennis program with 13 tennis courts - four grass courts, six clay courts, and three hard surface LayKold courts.